• DOCTOR FORMULATED with Vitamin K2. Calcium is the most abundant and possibly most vital of all nutrients. Your children’s bones are alive. They are growing as we speak and not only that, they are replacing bone mass to existing bones. This is called remodeling. If remodeling does not occur according to its natural cycle, fractures and misshapen bones can result. In addition, calcium supports the contraction of active muscles, conducting nerve impulses, and enzyme activity. If you prefer your children to take vitamin K2 with your calcium, we have included safe and effective natural vitamin K2 is as menaquinone. Cal K Yums!™ uses vitamin D3 (as cholecalciferol) which is the same thing you would get from sitting out in the sun. It’s the most usable form for your body. For many children, adequate sunshine is no longer an option. With the busy indoor schedules, and requirements of religious dress supplementation is fast becoming the method of choice for adequate vitamin D intake. Magnesium supports so many things, what better time is there to take it if not with calcium. Treat your kids (or picky adult family members) know that they got calcium, vitamin D3, magnesium, and Vitamin K2 that you want them to have. 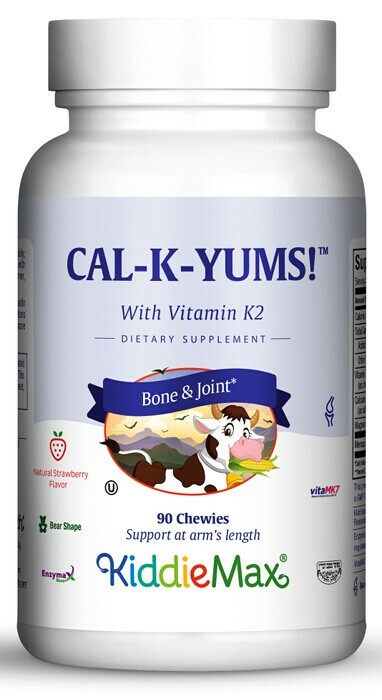 Get chewable Cal K Yums!™ With Vitamin K2. Chew four (4) chewies daily, two (2) with breakfast and two (2) with dinner, or as directed. Other Ingredients: Sucrose, maltodextrin (from corn), stearic acid, beet juice (for color), magnesium stearate, acacia gum, natural flavor, and Enzymax® (calcium carbonate, bromelain, papain, lipase, amylase, protease, silica).